Lots of updates this week. We have updated house plans. We received window estimates. We hired energy consultants and a land surveyor. We have estimates for the driveway and getting electric service to the site. It has been a very busy two weeks. First the house plans. No big changes. Most of the work these days is in the framing details, but it’s coming along nicely. See for yourself. We hired an energy consulting company called DEAP Energy Group out of Newton, Massachusetts. I found them through a project featured on ‘Renovation Nation’ on the Planet Green Channel. Nice guys and very knowledgeable thus far. 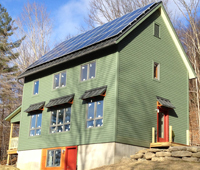 They specialize in PassiveHouse and Net Zero housing. They are using the PPHP software to model the energy use and gains of the house throughout the year. Energy use includes space heating, ventilation, water heating, appliances and lighting. Energy gains include solar gain through the windows. Although we’re not aiming for PassiveHouse or Net Zero certification, we are shooting for a ‘Near Zero’ home–as close as we can get to net zero while staying within our budget. I’ll keep you posted on their findings and recommendations. Windows! We knew the windows would be a big expense. It would be so much easier if American window manufacturers had a brain. They have finally started to produce very low U-value windows (SeriousWindows), but they also block much of the heating capacity of the sun, expressed as the Solar Heat Gain Coefficient (SHGC) value. While it still earns them and the homeowner an Energy Star rating, it sacrifices free heat energy from the sun. Why would you give up free heat? (See a couple of great articles, Windows that Perform Better than Walls, and Choosing Triple Glazed Windows at GreenBuildingAdvisor.com) Canadian windows with really low U values and high SHGC values cost 1.5 to 2 times the price of really good American made windows. We got estimates from 3 makers of fiberglass windows. Marvin Integrity (all Ultrex line), our only American manufacturer, has a low U-values but unfortunately low SHGC values. Marvin is our fallback option. The two Canadian window manufacturers, AccurateDorwin and ThermoTech Fiberglass both have low U-values and high SHGC values. AccurateDorwin came in 1.5 times more expensive. ThermoTech was more than double the Marvin Integrity windows. But with the higher SHGC factor, these windows should pay for themselves over time. I’m looking to my energy consultants to help show the expected payback period for each of these types of windows. Driveway update! The local soil conservation representative gave us the thumbs up for our proposed driveway path. Actually he recommended a slightly different path, but we opted to stay with the original logging road path. We have the OK from the town to redo the culvert connection to the road. And we have a preliminary estimate from the excavator for the driveway. Another part of the driveway effort is the property adjustment. We are swapping land with our neighbor so that we can take the easier path to the house site. The town has already approved the adjustment. All that is needed now is to do the survey and submit it to the town planning board. Then hire a lawyer to amend the property deeds so we can submit to the county. We met and hired the surveyor last weekend. And you thought this would be the easy part? As soon as we get some dry weather, we can begin the driveway! We also received an estimate from the electric company for running a power line up to the house site. The big decision here is whether we want to go above ground or bury the power cable. We’re leaning toward the above ground option because it’s looking much cheaper than trenching along side the driveway. And that’s not even taking into account extra expense of having to pound or blast through any ledge we encounter. Almost a certainty in our area. Unfortunately, going above ground means we have to carve a larger swath through the woods to make room for the poles and the power easement. We would prefer to go underground, but it’s looking like it may be shockingly out of reach.